In the prairie of the Midwest – Springfield, Ill. – my career started with a broom, and the willingness to clean up construction sites and use a shovel. I was a summer helper for my friend’s father who built elaborate houses in Springfield, and worked on part of their extensive remodel on an old mansion. Andy Deen standing in his most recently completed residential shower. At the end of the summer, I worked finishing concrete for a year after high school and eventually got in the electrical trade, but it didn’t satisfy me. There was an itch inside me that needed to create. I needed to explore construction and art; I needed to set tile. It was the only thing that would pass the time in an enjoyable way for me. I went to a local box store and picked up some material and tiled a kitchen in 2000, and then a friend’s mom’s backsplash, and then a shower. The prep work involved before the shower pans are poured and any tile is set. Next, I met Rob Yates – a NTCA member – at the supply house. We had not met before, but had mutual friends and started talking. He mentioned that I should check out the TCNA Handbook and go to a NTCA seminar when it was in town. I did – and everything completely changed, again. I was invigorated with new knowledge and access to years and years of previous work the handbook contained. A homegrown tile company had been created: Deen Contracting, Inc. (deentile.com), based in Rochester, Ill. In the middle of a cornfield in Central Illinois, I got a job with one of our local farms. 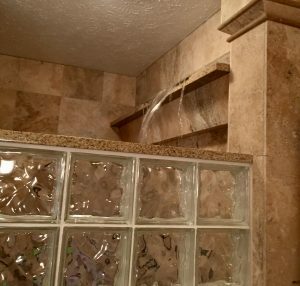 I was dying to try tile installation on a 3D-scale and I wanted to do crown molding with a waterfall off it for bathing. I had an idea and the homeowner, Dennis, made the plumbing work – he can probably fix an alien space craft if it crashed in a field! I field-framed the crown ledges from 1”x 4” pine and then I clad it in cement board and membrane. Next, I used foam. I have even used .050-gauge aluminum sheets and bent them into forms to be filled with mortar. My first ledge was in 2006 with a lot more geometric tile installs since. There are endless possibilities of which we have only scratched the surface. When I say “we,” I am referring to installers who truly care about their art. I have been on course to manufacture kits, however, funding to change an industry can be hard to obtain, so I have been utilizing my print reading skills from my electrical experience to bid commercial jobs. We have gone from 10% commercial work to 80% in about four years. 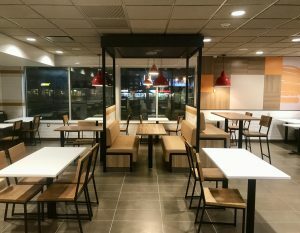 Commercial restaurant project, recently completed. The first time I had real guidance in the industry was in 2012 when Mark Heinlein from NTCA had a seminar in Springfield. His knowledge and approach to explaining setting techniques was top shelf. By attending the meeting and joining the NTCA, I was empowered with a great deal more knowledge. The TCNA Handbook has all of the ANSI ratings for products and installation, so by being aware of this, I was able to cite the proper pages and explain installations on my scope of work for commercial products. When I placed these references in my scope of work, I found that I was getting more jobs. By just attending a NTCA function and utilizing the information they gave me, I have increased my business. Until now, I have been pretty guarded about my creations and patents. However, the February 2019 TileLetter featured RodKat and it inspired me to share as well. I am impressed and always intrigued when a fellow tile mechanic installs in three dimensions. Just because we have a two-dimensional material to work with doesn’t mean we must stay there. Hats off to setters who are pushing the limits and exploring new designs. Tile crown molding with waterfall feature. I have been to the Coverings conference in Tampa, Fla., and had a great time. I plan on attending in Orlando this year as well. The conference is the best way for me to see new products and ideas and it is also the best way to re-charge my creativity. The key to staying busy in a small town is diversity. 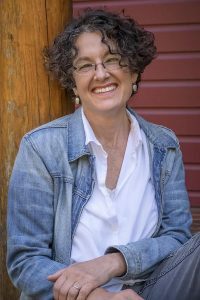 My wife Karen, who is a ceramicist, has been an irreplaceable asset and inspiration helping run the business, making payroll and putting bids in on time, as well as executing simple organization that I have botched for years. 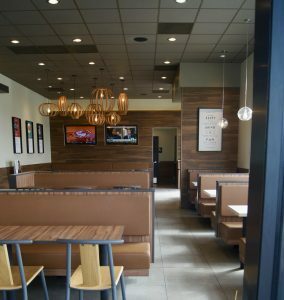 So, with our small crew of 3-5, we have been remodeling commercial restaurants. 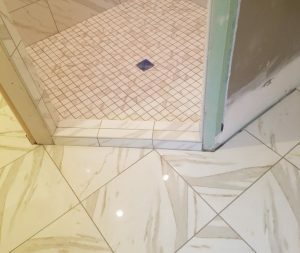 We go in and demo all the tile, and then polish the floor with mechanical grinders and install new tile throughout the lobbies, kitchens and bathrooms. In the course of doing this work, I have noticed the commercial kitchen is under attack. This is where I got my start at age 21, repairing epoxy grout in commercial restaurants before I landed my first residential builder. Epoxy grout is a must. 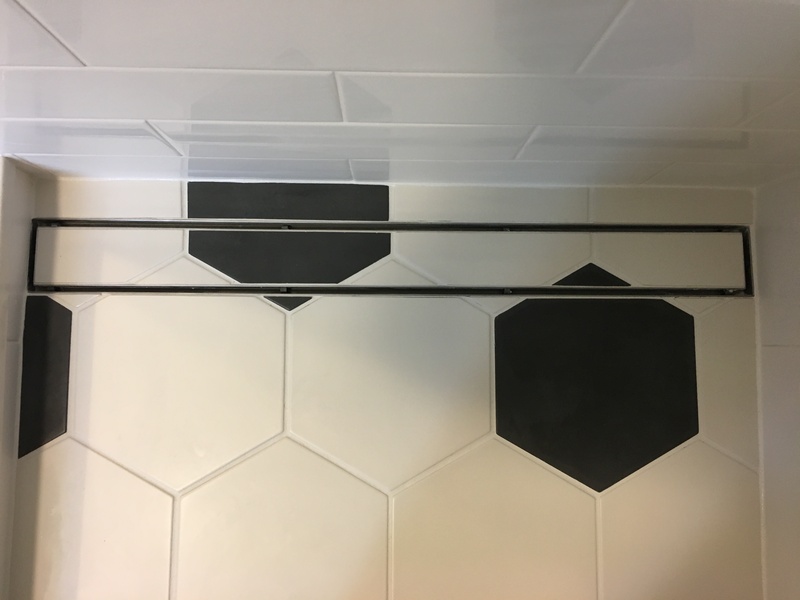 Incorrect installations and/or poor grout choices have hurt tile’s reputation in the commercial kitchen. Owners are switching to other products when they shouldn’t have to. A properly installed quarry kitchen could and should last 30-40 years with proper cleaning and minor maintenance. 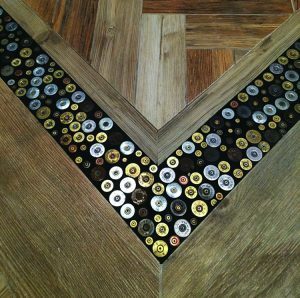 All in all, I love tile and I love to problem solve. To me, residential tile is art and commercial tile is problem solving and accuracy by the scheduled deadline. They are two different worlds that make both a great challenge and a rewarding career. I have been fortunate enough to have great product suppliers and so many local residential clients who have allowed me to create artistic spaces in their home. In addition, I want to give a big thanks to the people before me who have helped inspire me and continue to do so! Sometimes, good things can come from bad beginnings. 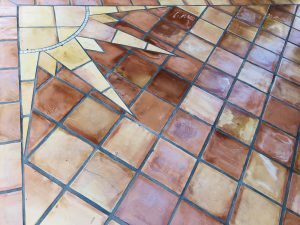 By his own admission, Michael Moreno, the owner of Artisan Tile, was a “horrible helper” when he started out in 1987 in Santa Barbara, Calif., where he was employed for a husband/wife tile setting team. Eventually this couple went out on their own, hired Moreno, and over a period of 14 years, taught him everything he knows today. 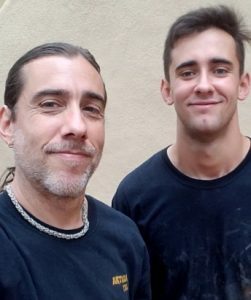 Michael Moreno, Artisan Tile owner (left), with his son, Michael Jr., who recently moved and works for a tile company in Flagstaff, Ariz.
Moreno was 18 when he started working with them, and was their first employee, so he watched their outfit grow into a premier high-end company. In 2002, he left their employ, and started working for a one-man show out of Lompoc, Calif. But after two years, he was dissatisfied by the lack of learning anything. “I was spinning my wheels, with no path forward,” he said. Though he never felt “good enough” to go out on his own, his two years with the Lompoc company made him feel that he was “going backwards. This 200-sq.-ft. project of round Saltillo was planned, and in great detail. Today, he owns Artisan Tile in Lompoc, Calif., that gets 90% of its business – mostly residential – from referrals, without a website! Why? 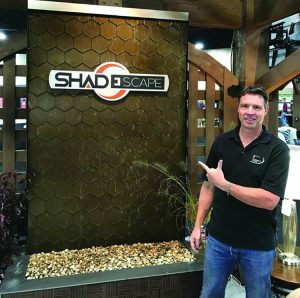 He stands out from the crowd due to his attention to detail and a certain artistic flair that stems from the artistry and precision he learned when working for the tile setter duo. This spontaneous, unplanned Saltillo corner sun was just fun to do, Moreno said. Moreno has been a NTCA member for only a year, which he joined to bring himself up to date with proper installation methods and materials. Though he is still feeling out the ultimate benefits of the association for his business, he said he has “found great value in having access to a variety of tested methods, materials and professionals through the NTCA. What I do take away from it is knowledge and a community that wants to bring this age-old trade into the future with informed and educated installers. 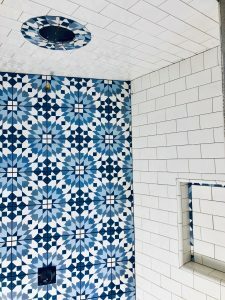 This shower featured blue encaustic tile with 3”x 6” subway tile. RODKAT: Integrating high design with function! I grew up working in a custom cabinet shop that my parents owned. I was always building something and learned, at a young age, the skills of working and creating with my hands. At age 16, I started working with a schoolmate that had seven older brothers, all with their own tile company. 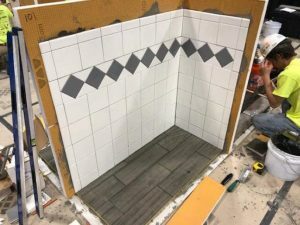 That first day I was blown away when I saw how much prep went into the tile installation process. My job was carrying buckets of mortar to the bathrooms where the brothers were floating showers. I knew those guys were doing something very specialized that not everyone could do. They explained to me how they were making the walls plumb, square, and flat with the mortar and float strips. I knew right away this was the career I wanted to pursue. Rod Katwyk playing in the mud, age 20. At age 18, I moved to the Bay area of Northern California to work for my cousin. He was a union tile contractor and learning from him was like going to the Harvard of tile setting. We did very high-end, custom residential and occasionally commercial work. As the trend turned to natural stone I used a lot of what I had learned in the cabinet shop as far as cutting shapes, miters, and book-matching. I really liked working with natural stone and having some freedom to custom cut to achieve better layouts. At age 22, I moved back to Utah and got a job with a company installing tile in custom homes in Park City. The skills I acquired while in California really helped me to advance to the top of the class, so to speak. These new developments were attracting owners who were building homes similar to the kind I had worked on while in California. I decided it was time to get my license and start my own tile company. So at age 23, Katwyk Tile was born. I specialized in custom, high-end residential and enjoyed the challenges of making the homeowner’s vision, the designer’s choices, and the contractor’s reality all come together. 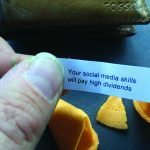 Social media skills paid off for Rod Katwyk! The fortune cookie confirms it! In 2009, a Facebook friend introduced me to the John Bridge Tile Forum. This was the start of networking with other tile people from around the world who are just as passionate about the trade as myself. I am still very close with a handful of people I started conversations with the first day on the Forum. From there, another Facebook group was hatched – Tile Geeks. This is where I was able to share and get feedback on installation ideas and techniques. shop made templates and cut the top pieces for the tile installer. second story exterior balconies using wedged foam that I had custom made to create the slope. I had a light bulb moment. 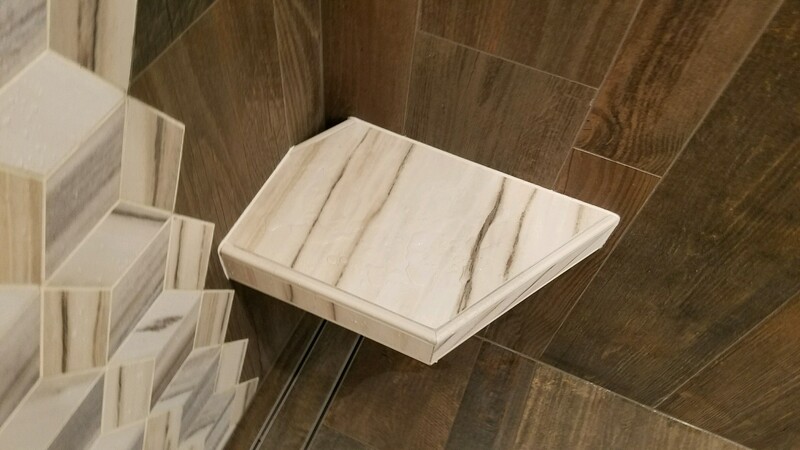 Why not attach a wedge to the back of the tile creating a 3D look using any tile? After obtaining a patent, this was the beginning of 3D Stone and Tile. This became a niche market for me as I started picking up jobs installing 3D feature walls in both commercial and residential applications. I also started selling my product to tile suppliers and installers. Because of social media, my product was introduced to an internet tile tool company that wanted to distribute my product. This opened the door to introduce other products I developed. The line was branded as RodKat products. I started enjoying having tile contractors as customers more so than dealing with owners and builders. This has allowed me to put together a cut shop where I offer water jet cutting, strip cutting, bullnosing, and custom foam cutting services. Thanks to a great staff at the shop, I can actually walk around in circles all day and be productive. Katwyk came up with this bullet inlay a few years back and has been asked to do four more since the first one. I went to a NTCA workshop in 2014 and met Michael Whistler and Mark Heinlein. 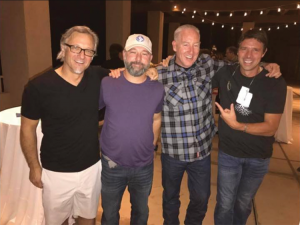 I joined the NTCA that night and spent the next day with Michael and Mark driving them around Park City showing them some of my projects. We shared a lot of knowledge back and forth, along with some laughs. Best of all, I made a couple more phone-a-friends that I could call on when I had technical questions. In 2016 I hosted an NTCA workshop and met Robb Roderick, who was presenting. I was happy to host the workshop because it brought in tile contractors from my area that had never attended a workshop or heard about the NTCA. 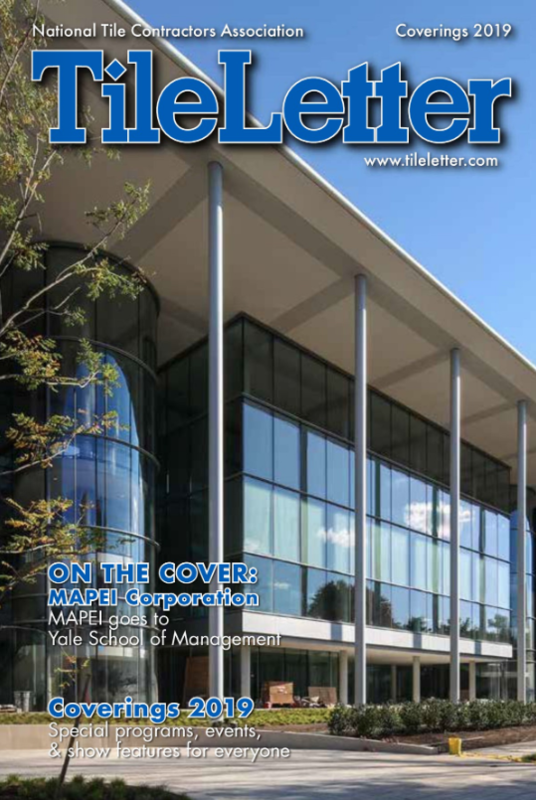 I read the TileLetter cover-to-cover every month and always learn something new. The 2018/19 NTCA Reference Manual has also been a great source of information that I turn to often and refer others to as well. The best things that I have made while being in the tile industry are the friends along the way. Social media and events like Coverings and Total Solutions Plus have led me to my second family. Katwyk was commissioned to make this water feature for a home and garden show. 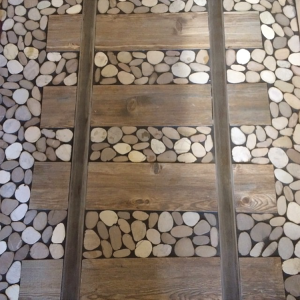 Katwyk intentionally set the tile planks crooked for rustic effect, worked the metal to patina the rails and hand set the pebbles, one by one. 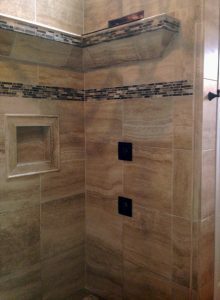 Russell Laird, of A+ Tile & Stone in Sacramento, Calif., (aplustileandstone.thebluebook.com) has made a name for himself in the tiling world, aiming for excellence in his typically commercial, public works projects. “Quality is what sets me apart from my competition,” Laird said. “I personally oversee every project and train my employees to do an excellent job so we don’t ever have any patch work or callbacks.” Though his company considers itself a commercial contractor, it applies this same level of quality to residential work for friends and family. 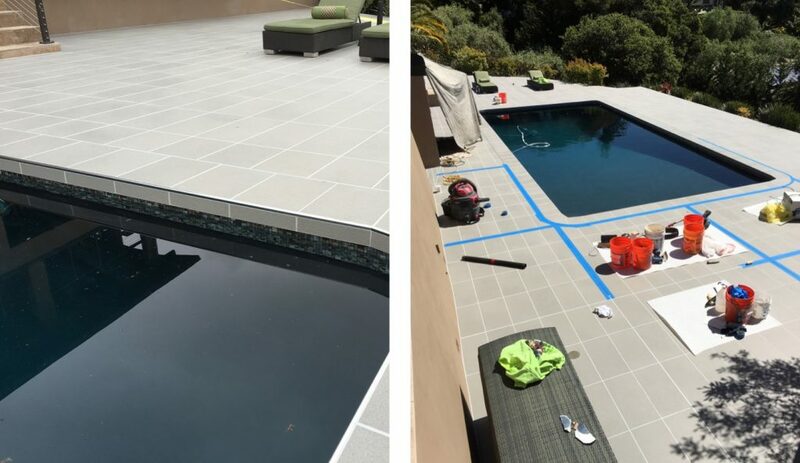 For this pool deck in the San Francisco Bay area, A+ Tile & Stone floated an entire deck that was stamped concrete to make it flat enough to receive large format 12” x 24” tiles. The crews used uncoupling membrane over the entire floor and expansion joints per EJ-171. They finished off with stainless steel edge trim at pool edge and bottom of skirt. After three years of association membership, Laird decided to pursue NTCA Five-Star Contractor status. Laird is a big believer in the strength of qualified labor, and has made it a goal to get his installers credentialed. 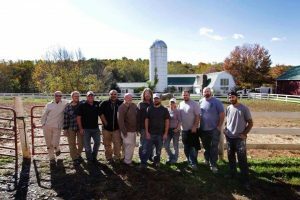 “We currently have four installers certified, which is 100% of my full-time installers including myself,” he said. “We all took our test at Surfaces in Vegas, which is about a 10 hour drive for us.” Laird himself is CTI #1091 (See TileLetter’s Qualified Labor story in December 2015, for details), and passed his exam in January, 2015. 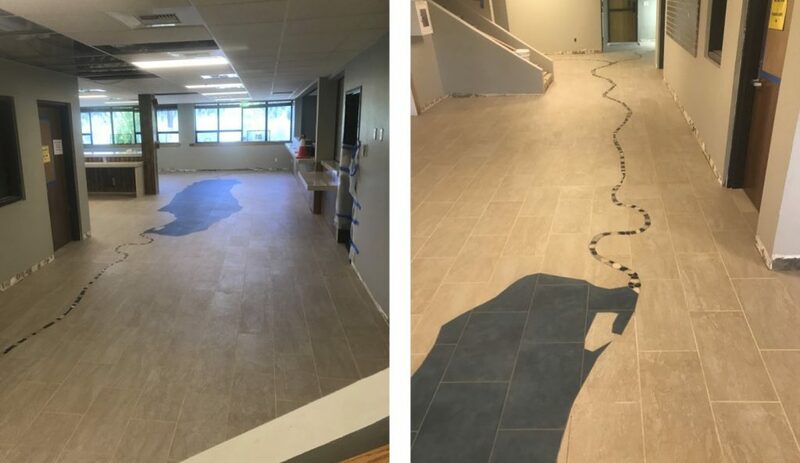 This lobby at Truckee Public Utility Office features an inlay of Donner Lake with blue tile and river with pebble stone. This remodel had an existing slab that varied 1-1/2“ in elevation, so Laird and his crew ground 1/2” off the high spots and floated everything level to that. They chose this strategy because the elevator was at that elevation and not movable. The floor angled down to the front door to meet that elevation, bending at a grout joint. The contractor employed a tile band saw for some of the radius cuts. 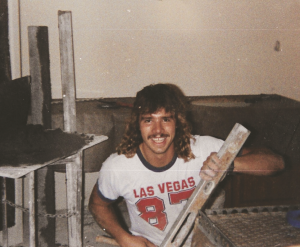 I started in the tile industry almost 40 years ago, working as an apprentice. My first day on the job was spent at a mud box with a mud hoe in my hands. When I started out, everything we did was mud. All walls and floors were hand mudded. It wasn’t too long that my tile mechanic had a hawk and trowel in my hand and was teaching me how to mud walls and mud floors. We did mostly commercial work and I traveled all over the Southeastern U.S.
Roberts worked installing tile on the world’s largest sundial at Walt Disney World, in 1991.
being the world’s largest sundial. We helped tile the outside facade with 3” round green circles, one at a time. After traveling for 15 years doing tile work in the Southeast, I hung up my commercial work boots and married an interior designer and formed a design-build business based in Orlando, Fla. I continued to install tile, but in high-end residential projects. One memorable project was in Telluride, Colo., for a vice president of Marriott Corp., who hired our firm to completely remodel a ski house. After living in sunny Central Florida most of my life, I learned quickly about Carhartt jackets and bucket heaters for your wet saw in February. In 2008, after the economy had crashed and the Central Florida market died, I decided to move to Atlanta, Ga. Fast forward 10 years – I am now outside Dalton, Ga., close to the mountains. 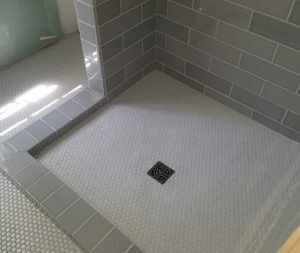 After many years of commercial tile setting, Roberts now installs tile in high-end residential projects. Roberts is a Regional Evaluator, helping to bring CTI tests to interested tile setters all over the Southeast. Through social media and tile groups I found out about and joined the NTCA in the fall of 2015 – one of the best decisions I have ever made. I have made many friends in the tile industry and am very proud to call a lot of them tile brothers and sisters. 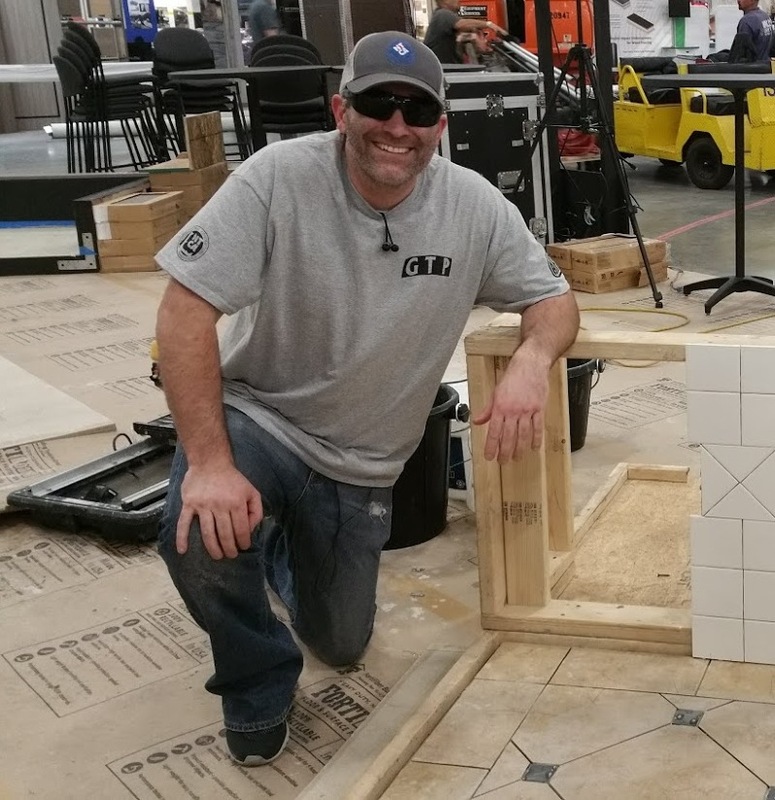 I attended my first NTCA workshop early in 2016 and met Scott Carothers, the director of the Ceramic Tile Education Foundation (CTEF), who encouraged me to take my Certified Tile Installer (CTI) test. In Dec. of 2016 I took my test in Pendleton, S.C. at CTEF along with a special Tile Love/ Schluter sponsored workshop. The best Christmas present ever was finding out I passed my test to become CTI #1278. I then volunteered to become an NTCA State Ambassador. In 2017 I became a Regional Evaluator for CTEF and hold CTI tests all over the Southeast. This has been truly meaningful to me, as I love teaching younger installers the trade and it has become a passion, to teach them industry standards. 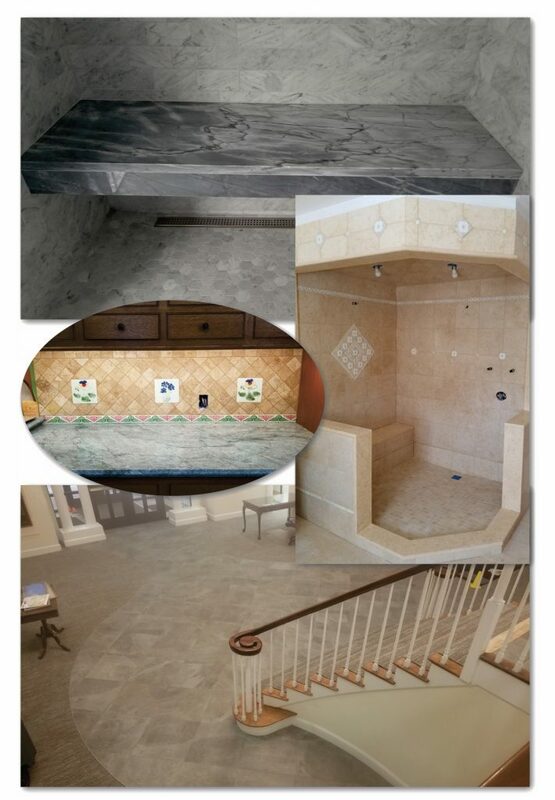 In March of 2018, I helped NTCA Five-Star contractors Woody Sanders (DW Sanders Tile and Stone Contracting, Inc., Marietta, Ga.) and Rod Owen (CC Owen Tile Co., Inc., of Jonesboro, Ga.), and NTCA member Cain Curtis (A Tile Experience, Atlanta, Ga.) with the Georgia Skills/CEFGA high school tile competition. I helped to build the modules and judge the competition. This was a great experience for me, as I got to help instill a love for our industry to these young students. 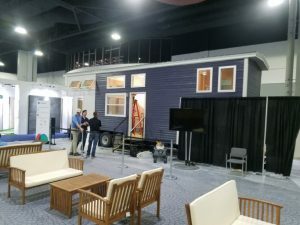 Roberts joined DW Sanders Tile and Stone Contracting, Inc, to set tile in the Installation Design Showcase Tiny House project during Coverings 2018. 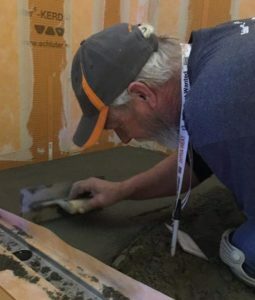 In May of 2018, I was asked by my friend Woody Sanders to help install the tile in a tiny house at the Coverings Installation Design showcase in Atlanta. This brought me back to working my commercial days with big crews in tight spaces. It was a great experience for me, and I am grateful to be asked to participate. These tiny houses were later towed to my hometown of Orlando, Fla., where they were set up in a park and rented out as Air B&Bs. 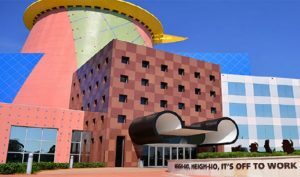 Maybe some lucky person will stay in one of them for the upcoming Coverings 2019, which will be held in Orlando. 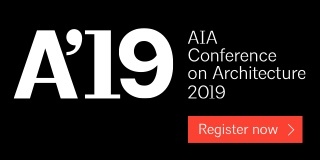 I highly encourage everyone involved in the tile industry to attend this show. You will not be disappointed. I have attended many Coverings shows, and Orlando is one of the top venues. This year I met so many people that I knew from the tile groups. One that comes to mind is “the man, the myth, the legend” 2018 Coverings Rock Star Jason McDaniel. 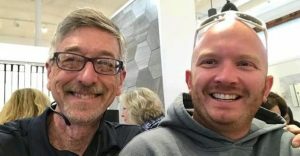 Jason runs a Facebook group called Global Tile Posse (GTP) and it was a pleasure getting to spend time with him at the Golden Trowel Challenge. 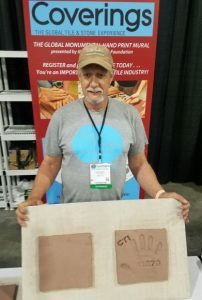 Roberts made his mark in wet clay during the Global Monumental Hand Print Mural Project held at Coverings 2018. I will never forgot attending Coverings in Orlando, back in 2015. While I was online in the Tile Geeks social media group, a guy was disappointed that he couldn’t attend, since his travel partner bailed at the last minute. I reached out to him, offering him lodging at my mom’s house with me for the show. I picked him up in South Georgia, on my way to Orlando and we drove straight to the show. Donovan Lucero of Lucero Flooring Company, Jesup, Ga., and I have become lifelong friends and brothers in the tile industry. We also met up with another great guy that I knew online through Tile Geeks, who has become one of my best friends: Ben Ernst. We walked in the Orange County Convention Center, and the first person we ran into was Brad Denny, NTCA Five-Star contractor (Nichols Tile & Terrazzo Co, Inc., Joelton, Tenn.) We knew him from Tile Geeks, but not in person. He grabbed us and brought us over to the NTCA lounge and made us feel at home. What a great guy; I am proud to call him a friend. 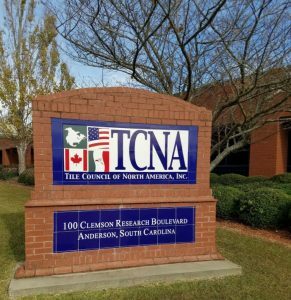 Roberts enjoyed a private, behind-the-scenes tour of the TCNA headquarters while helping present a CTEF introductory course in nearby Pendleton, S.C. I just finished helping Scott Carothers teach a weeklong class in Pendleton, S.C. at the CTEF in early November. The class was an introduction to ceramic tile and mortar shower bases. 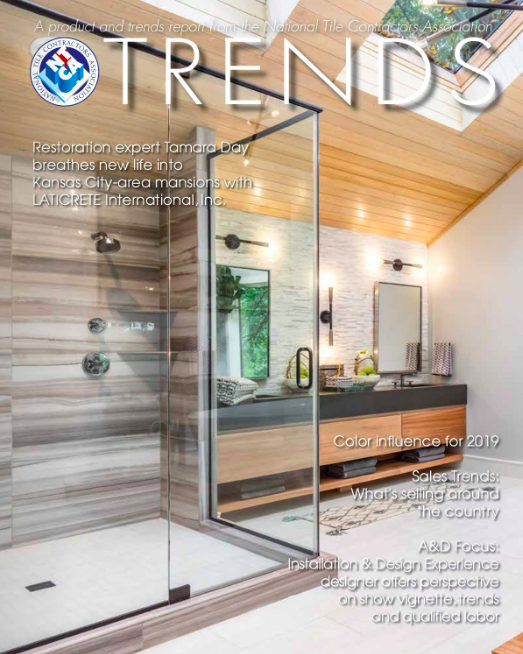 It was attended by people from all over the U.S., including staff from the Tile Council of North America (TCNA) – headquartered close by in Anderson, S.C. – and NTCA’s new Marketing and Communication Director Avia Haynes (see related story on page 54 of this issue). Some of us got a special behind-the-scenes private tour of the TCNA. This was a once-in-a-lifetime event, and am very proud to have been invited. Who would have thought that 40 years ago, mixing mud in that mud box, I would be where I am today: a proud member of the NTCA, NTCA State Ambassador, CTI #1278, CTEF Regional Evaluator and a tilesetter who takes pride in doing things that will last the test of time. You never know when the tile setting bug is going to bite. For instance, Ulas Maris of Maris Tile PRO in East Moriches, N.Y. (www.maristile.com) didn’t start his career in the industry. Instead, he was originally in hospitality, hotel and resort administration in Southwest Florida, years before he left his position and moved to New York in search of a new career and life. Ulas Maris (right) along with NTCA’s Training Director Mark Heinlein at a recent workshop. 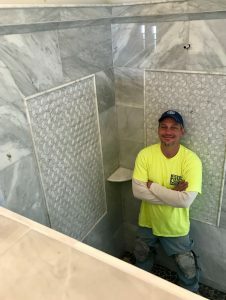 With his mentor’s encouragement and the encouragement of his wife Rachel, Maris now does high-end, custom installation throughout Long Island and the Hamptons. He works on new homes and renovations. 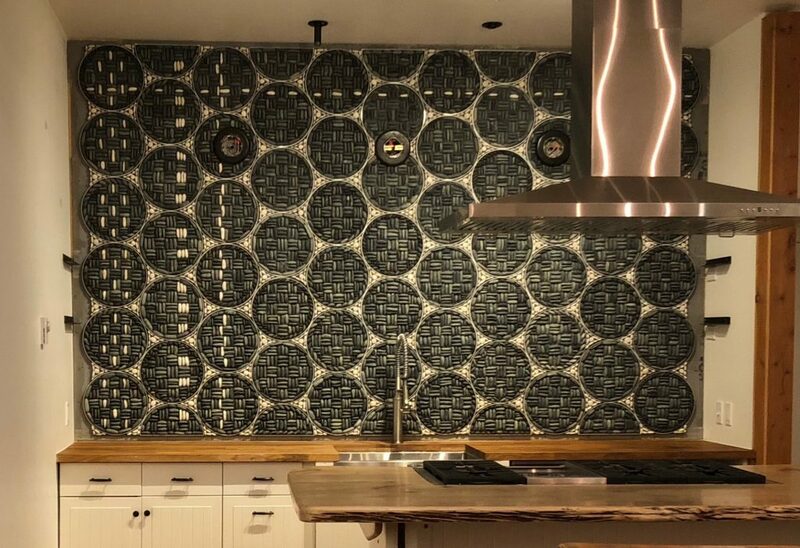 His specialty is mosaics, handmade tile, large-format tiles and natural stones. He also works with glass slabs and other sorts of glass material, and he fabricates custom marble, granite and quartz countertops. This philosophy has worked for Maris – he’s never advertised his business or services. Word-of-mouth recommendations from satisfied clients are all the advertising he has needed. 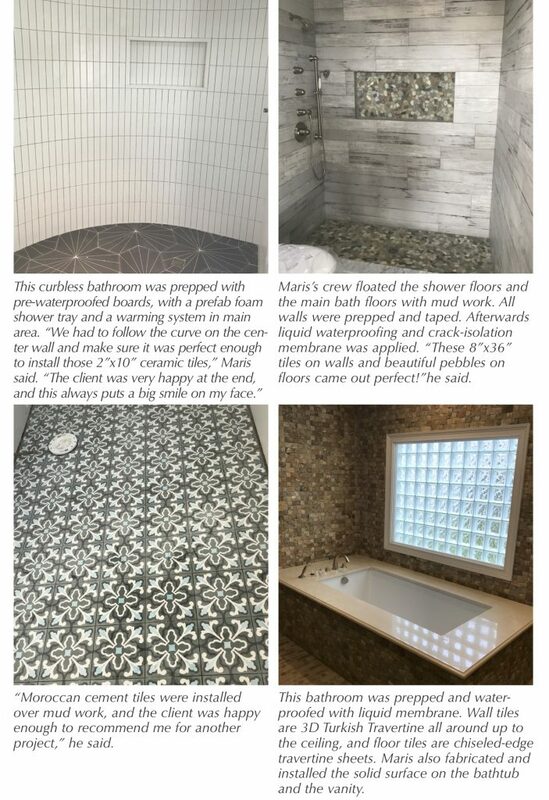 Great feedback spurs Maris on to learn even more about new tile and installation systems. “When I see a five-star review online for my work with great comments, it motivates me to keep learning about new systems, to become more efficient and do better with my profession,” he said. His drive to rise above the competition drove Maris to join NTCA three years ago. He benefits from interacting with other installers across the country, which positively impacts his business and work relationships. “Since becoming a member of the NTCA, I have seen that I am taken more seriously at all meetings with my clients, general contractors and architects,” he said. “I have seen that being a member gives new clients confidence in my abilities. As the only CTI in his company, Maris installs most of the jobs himself. His staff keeps current by regularly attending manufacturer training classes and available education opportunities. And he is focused on being as knowledgeable about tile systems and “eager to learn more. 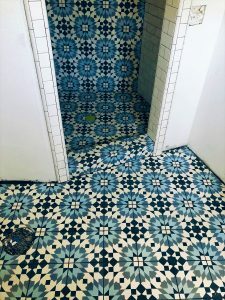 Before Nadine Edelstein, of NTCA member company Tile Design by Edelstein, developed a following with her distinctive tile work, her early training was studying molecular and developmental biology. “I was interested in the processes involved in pattern formation in developing organisms,” she said. If you’ve seen any of Edelstein’s work, you’d agree that her style – which honors the deep historic roots and cultural significance of this industry – pays homage to organic patterns and processes, transforming them into elegant works of art that serve her clients with functionality, beauty and singularity. This ungrouted installation is the feature wall of a new cooking school. Edelstein sorted and cut the pebbles, and used 1/4” foam board waterjet cut into circles and triangles. Pebbles were arranged and attached and made into circular and triangular “tiles” in her studio, then installed onto the wall with tinted thinset mortar over concrete board. Sheet aluminum was cut, bent and welded into the circular frames. 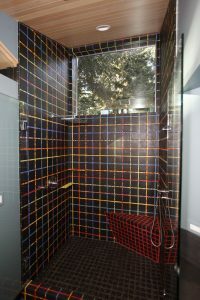 Edelstein designed and installed this shower with handmade glazed terra cotta tile and colorful Italian Smalti glass. 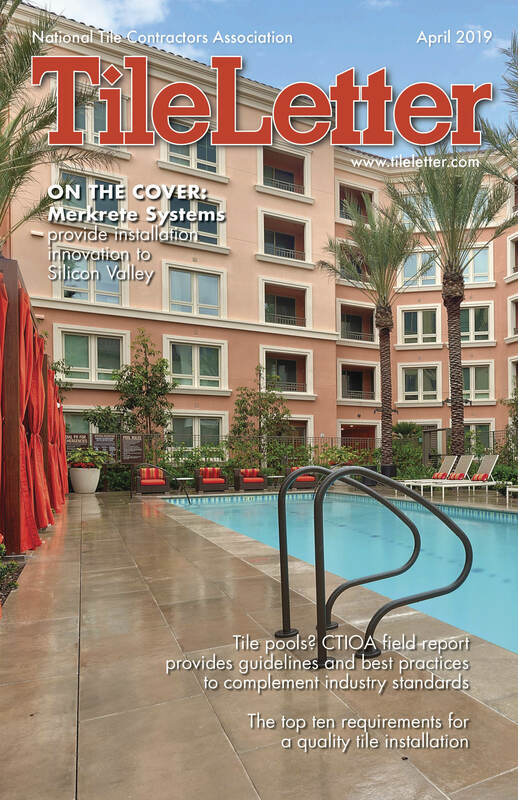 It received the 2018 CID Residential Tile Installation Award. Her studio is 100% women-run, with all female assistants. “I am happy to see more women joining this career path, and look forward to a time in the near future where it will not be the novelty that it has been,” she said. Largely self taught, Edelstein came to NTCA 10 years ago seeking the support of the technical resources to support her knowledge. She also thought NTCA affiliation would help her business stand out. In fact, NTCA has become a “sort of partner” to Edelstein’s business over the years. 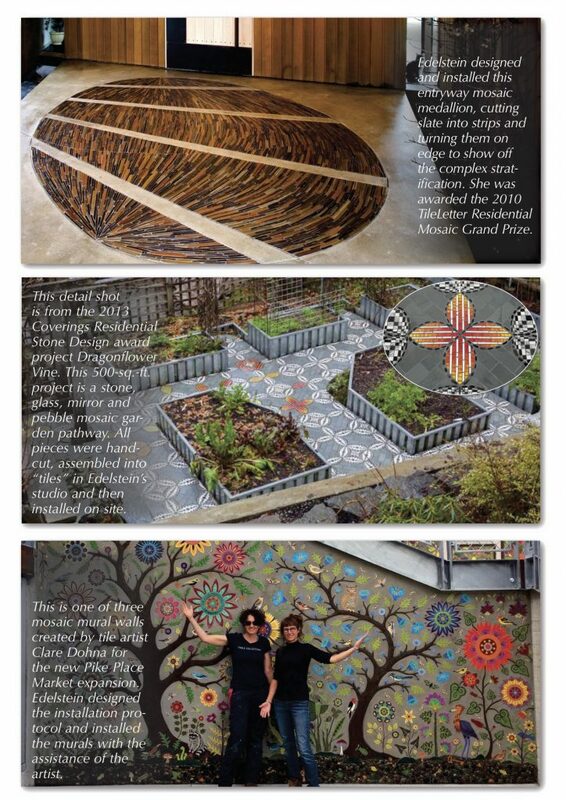 Edelstein has won a number of awards, including the 2010 TileLetter Residential Mosaic Grand Prize, 2013 Coverings Installation and Design (CID) Award for Residential Stone Design, and 2018 CID Award, Residential Tile Installation. Interested in learning more about her work? View her professional profile on Houzz.com and a portfolio on Instagram (@tiledesignbyedelstein). What do Legal Sea Foods of Boston and tile contracting have in common? Stephen Belyea, owner of JSG Tile and Stone LLC in Weymouth, Mass. 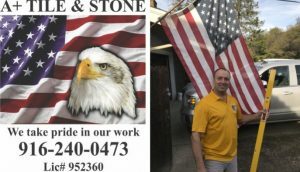 (jsgtileandstone.com) is the common thread in both scenarios. Belyea gave up his career as head chef at Legal Sea Foods and pursued commercial flooring work with a small company while he was contemplating his next move in the restaurant business. “When I realized how much better life could be not working 12-15 hours a day, I stuck to learning as much as I could about flooring,” Belyea said. “I worked my way up to a lead installer and enjoyed the work I was doing” – work that included installing carpet, wood, vinyl, rubber and turf in the gyms at Gillette Stadium and Fenway Park. 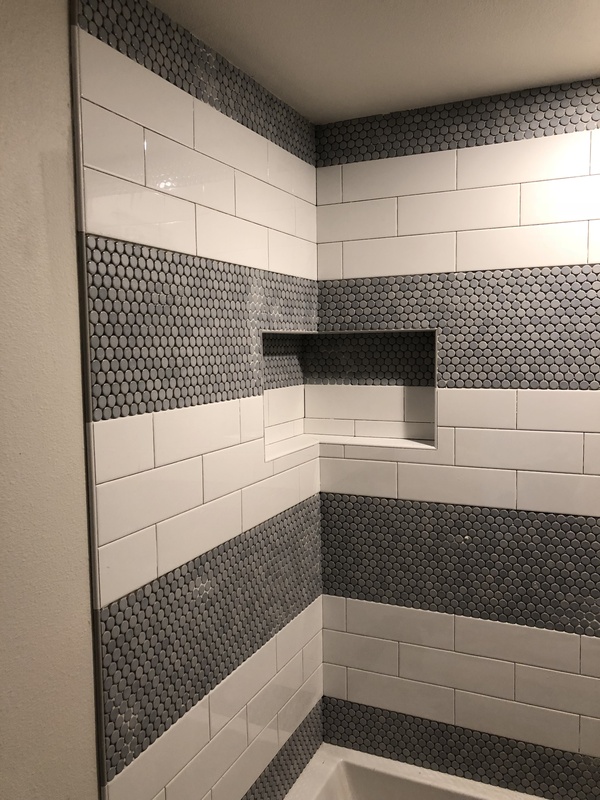 The Tile Geeks Madison Fields Project in 2017 was one of the most rewarding personal and professional projects in which Belyea ever participated. 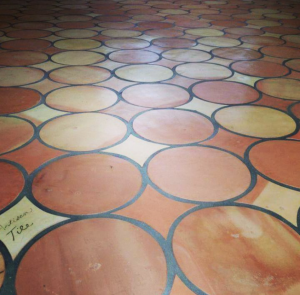 In 2014, he discovered Tile Geeks on Facebook – only 500 strong at that time. “I realized from that page that there was a hell of a lot of knowledge about tile I did not have.” Belyea said. “So I made a point to learn about all the new/different techniques and tools there were. 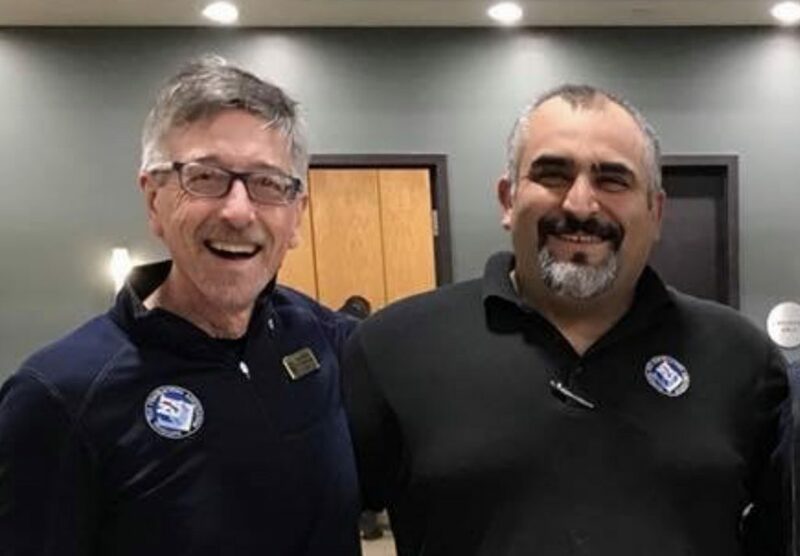 I have attended Coverings in Las Vegas, Chicago, Orlando, and Atlanta.” Belyea met Salvatore DiBlasi through Tile Geeks and in person at the Journal of Light Construction show in 2015 and the two have been great friends since. Brad Denny (L) signed Stephen Belyea to NTCA membership in Coverings 16 in Chicago. In December 2016, Belyea and DiBlasi took a road trip to the CTEF in South Carolina to attend a Tile Love/Schluter/CTI event. Belyea also took the Certified Tile Installer (CTI) test and passed as CTI #1274. CTEF’s Scott Carothers evaluates Belyea’s CTI hands-on test. 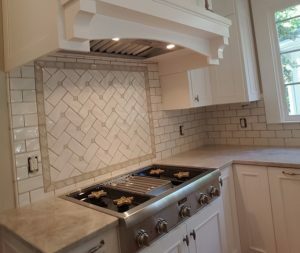 Today Belyea is cooking with gas, bringing artistry and excellence to high-end residential custom tile projects, from new construction on summer houses in Cape Cod to renovations on multi-million dollar residences in downtown Boston. 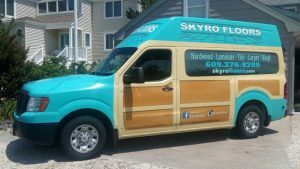 This Skyro vehicle is as beautiful as the floors it helps Ken to install. NTCA Training Director Mark Heinlein (L) signed Ken up as a member at a recent training event. Ballin says that unfortunately the proverbial rug was pulled out from under his feet when the box store decided to go with a work room format instead, jettisoning the small companies doing their installs. 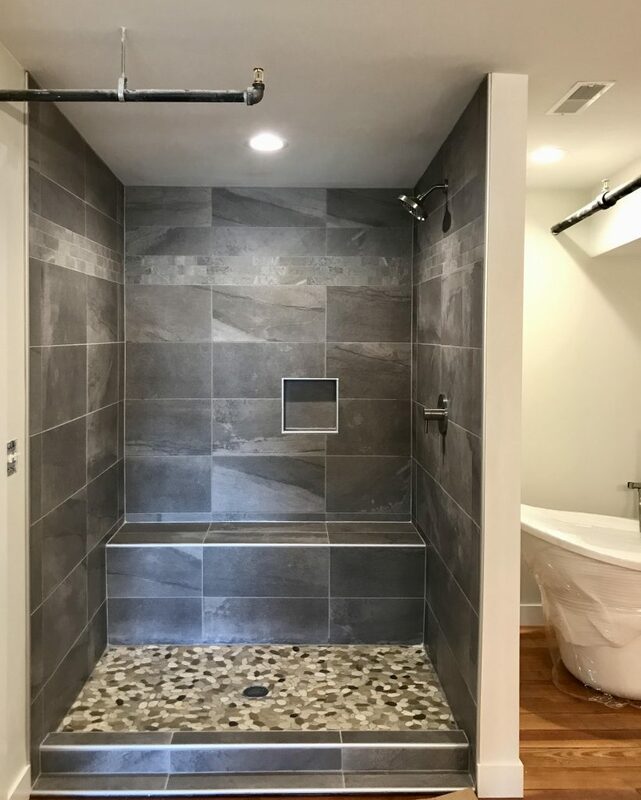 Today, Skyro Floors installs tile, hard surface flooring, and concrete overlays in mostly residential remodel projects with some new construction. Though Ballin has only joined the NTCA in the last few months, he’s always been focused on training and bettering himself. “I’m hungry for knowledge so first I got certified for hard surface flooring with CFI, then I took and passed the CTI test, and most recently joined the NTCA,” he explained. “I try to focus on higher-end/higher-paying customers since I live in a tourist market. While I’m still learning every day myself, I try to share my knowledge with others as much as possible. “I joined the NTCA because aside from my love of the industry I wanted to see firsthand what it can do for my business,” he continued. “I’ve heard the ‘voucher argument’. I’ve also heard that some small business owners felt it was more geared towards bigger companies so instead of just listening to stories I decided to find out for myself. What better way than to jump right in? Jason McDaniel, owner of Stoneman Construction, LLC in Portland, Ore., was recently recognized as an emerging young leader in the tile industry by his inclusion in the Coverings Rock Star Awards. Here, in his own words, he tells the story of his company and his passion for the industry. – Ed. I am a custom residential tile contractor, with a background in granite and quartz fabrication. I love creating beautiful spaces that I know will stand the test of time and be something my customers will love. I started setting tile 11 years ago to keep busy when I didn’t have kitchen countertops to install. Eleven years later I have found that my fabrication ability makes being creative with tile fun and easy. 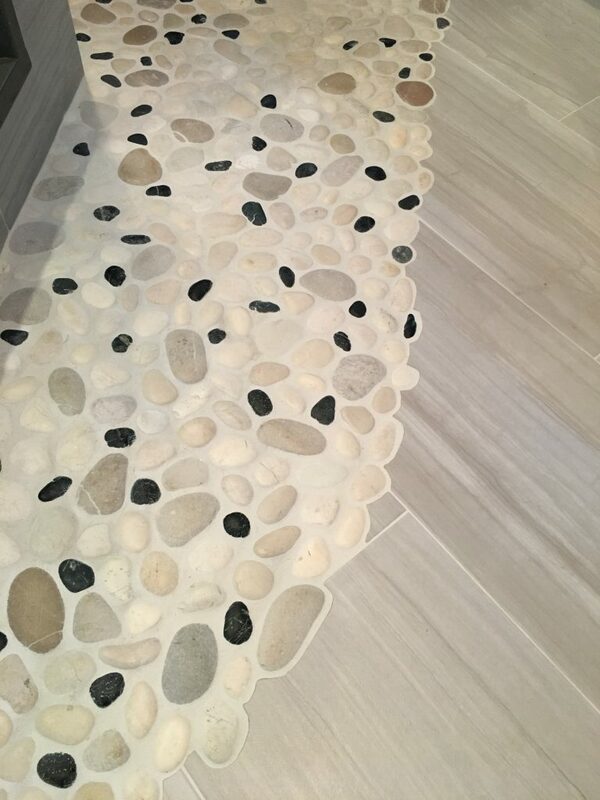 Stoneman Construction is known for templating backsplashes, floors and walls, making it easier to lay out and install complicated projects. We have done many projects incorporating scribe work into the design and we also specialize in self-leveling underlayments. My brother, Shawn McDaniel, was a painting contractor for 20 years and came to work with me two years ago. He has become extremely efficient at shower prep and applying liquid anti-fracture membranes. Coming from a trade that required a high level of cleanliness and detail made it a seamless transition for him. I feel very fortunate to have such qualified people working with me on a daily basis. Jeremy Bickett, CTI #1353, moved to Portland a year ago and now works full time with us. 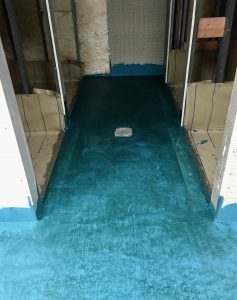 His background in self-leveling underlayments (SLU) has made it possible for us to fix and level almost any floor in our market, setting us apart from the competition. Together with Jeremy, Shawn and myself, Robert Brazington rounds out the crew. I am a two-year member of the NTCA and a NTCA State Ambassador. Years back, when I started setting tile, I was taught incorrect ways of doing things and had no knowledge of any associations or certification programs in the industry. Since I discovered these organizations existed I have done everything I can to get involved. 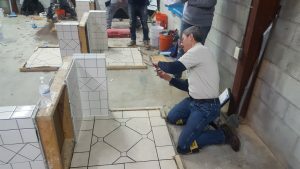 Through the NTCA I discovered the Certified Tile Installer (CTI) program, a certification exam administered by the Ceramic Tile Education Foundation (CTEF). Being a Certified Tile Installer and a NTCA State Ambassador has given me credentials I didn’t have previously. I am taken much more seriously in meetings with architects, general contractors and homeowners, and the amount of knowledge I have gained gives me more value when bidding projects. Being able to answer a wide variety of questions in regards to my profession gives the end user confidence in our company. In our company of four, three of us – Jeremy, Robert Brazington and myself – are Certified Tile Installers. My brother Shawn aims to take the exam when he is ready. 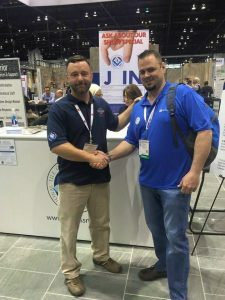 The CTEF Regional Evaluator Program has given my evaluator partner and one of my closest friends, Shon Parker of Hawthorne Tile, and me an opportunity to be on the front lines of training and testing installers of all ages who are new to the trade, or veterans wanting to expand their skills and knowledge. (Regional Evaluators administer the CTI exam, and their growing numbers mean that more people across the country have the opportunity to take the exam. – Ed.). In my opinion, getting more people involved and ensuring they have the proper skills going forward is the most important thing any of us can do for our industry. With the help of people like Dirk Sullivan of Hawthorne Tile, Heidi Cronin of The Cronin Company, industry representatives, and Global Tile Posse – the industry-related page I created on Facebook – we are having great success here in the Pacific Northwest. In fact, creating the Global Tile Posse on Facebook has been a huge help to bring recognition to this amazing family of people and to the NTCA, who are out there working hard to help us as tile setters and business owners. One of the greatest joys I get from being a tile contractor is hearing from people all over the country who are positive and energized about learning and growing and sharing their experiences. In Global Tile Posse we have created a family environment where anyone can come in and talk about their experiences and growing pains in this industry. The other great joy I get is creating art. 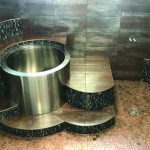 The people in the tile industry are getting more and more requests to create really beautiful and unique spaces for our customers. Being able to help design and execute a truly artistic space is very satisfying.